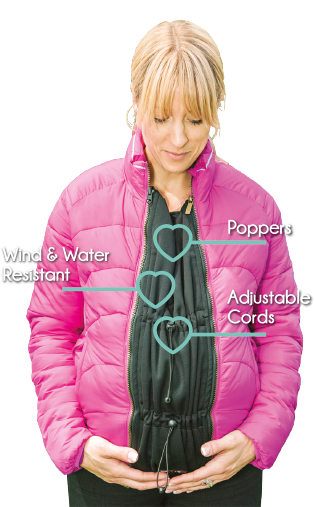 The ZipUsIn Universal Jacket panel extends your coat for bump or baby! A waterproof solution for extending your coat from bump to babywearing on the front. The ZipUsIn universal jacket extender is a simple, single solution that fits over every zipped jacket, no need for extra adapters. This will also help with tandem carrying if you already have a babywearing coat; one child on the back with the coat panel and the other on the front under the ZipUsIn! The ZipUsIn Universal Jacket Extender is here at last; a simple, single solution to extending your zipped jacket to fit over your bump or your baby in a carrier on the front. This will also help with tandem carrying if you already have a babywearing coat; one child on the back with the coat panel and the other on the front under the ZipUsIn! The ZipUsIn universal jacket extender is a brand new clip-on panel which features a unique system that locks to the teeth of any zipper. Separate the two sections of the clip to open it, then place the two sections around the teeth of your zipper so the teeth are nestled inside, and then press the clips into place. Your jacket zip is now gripped inside the clip. The clips remain in place for the duration of time you wish to use the panel and your jacket can then be fastened with the integral zip. The machine washable soft-shell fabric is waterproof and wind resistant and has pull toggles to allow for adjustability.